If you didn’t know by now, Paris is one of my favorite cities in the world. When my mom retired, my sister and I figured it was the perfect time to have a girls trip to celebrate this milestone and we decided on Paris. This would be my moms 2nd trip there, my 3rd and my sisters very first time in this incredible city. My first thought was how excited I was to be going on this adventure with them but my 2nd honestly was stressing out a little about doing the same exact thing I had done in previous trips, over again. Thankfully I came across this really unique tour of the city and knew I had to book it. 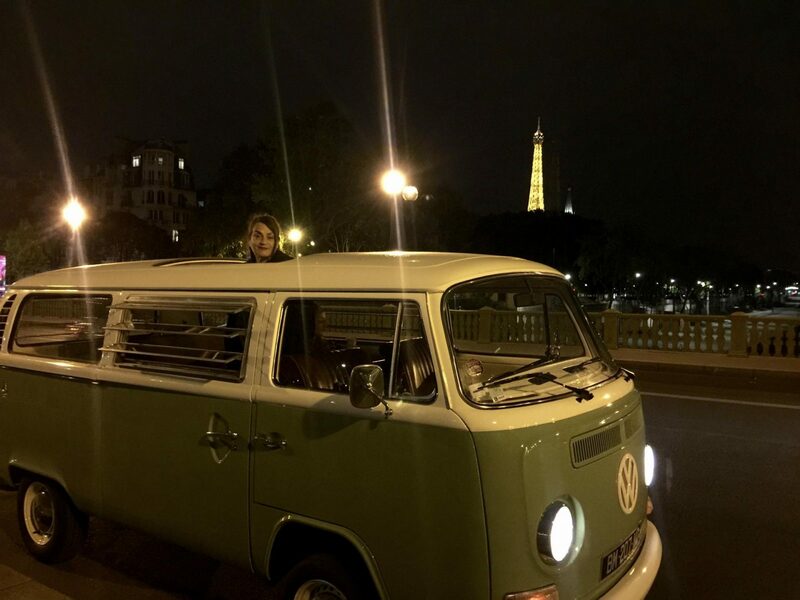 Cedric’s Paris offers many different tours around Paris while cruising in one of their old school CV2 cars OR a larger VW Kombi. 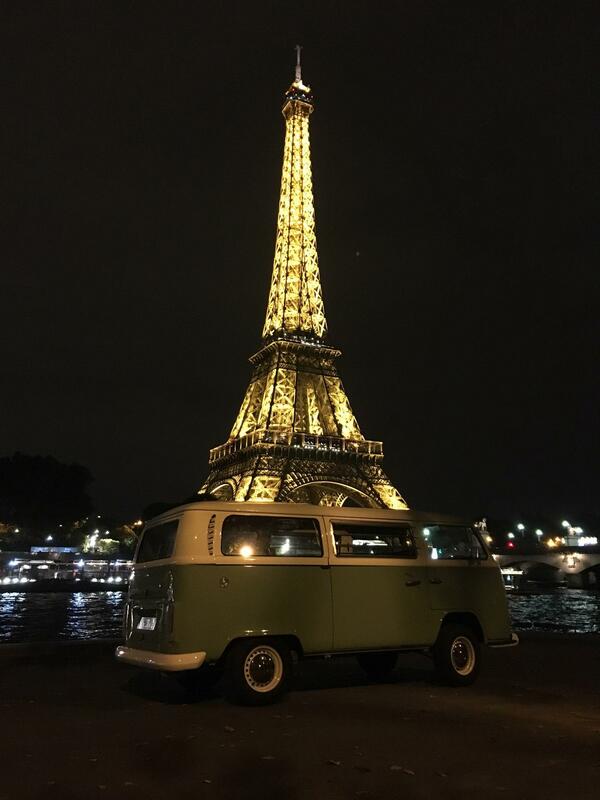 While we would have fit very comfortably in a CV2 – I had my eye on the Volkswagen Kombi and decided to splurge and book that instead… after all, we were there to celebrate! 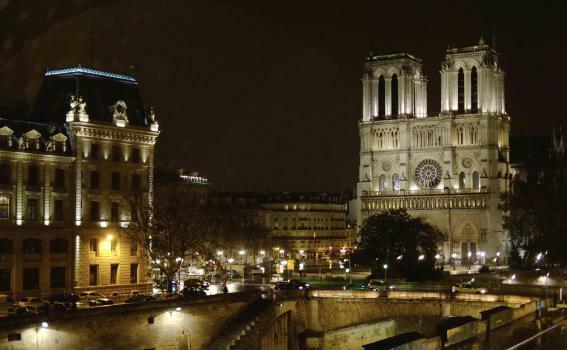 Cedric’s Paris offers many different types of tours but we went with the 2 hour Paris by Night Tour. There is something about Paris at night that is unforgettable and truly mesmerizing and by the end of the tour, I was so happy we decided on this one. Chris was our driver and he picked us up promptly at 9:30pm. When you book a 2 hour tour, Cedric’s Paris will give you a complimentary additional 1/2 hour or a bottle of champagne. We decided to go with the extra time and brought along 2 bottles of our own champagne. He mapped out a personalized itinerary based on what we told him we wanted to see and it was perfect in every way. When you go to Paris you visually see these iconic monuments and grand buildings and while you are in awe – do you know the background history of what you are seeing? More than likely – No. Chris was full of knowledge and besides the incredible views, we learned so much about the city. 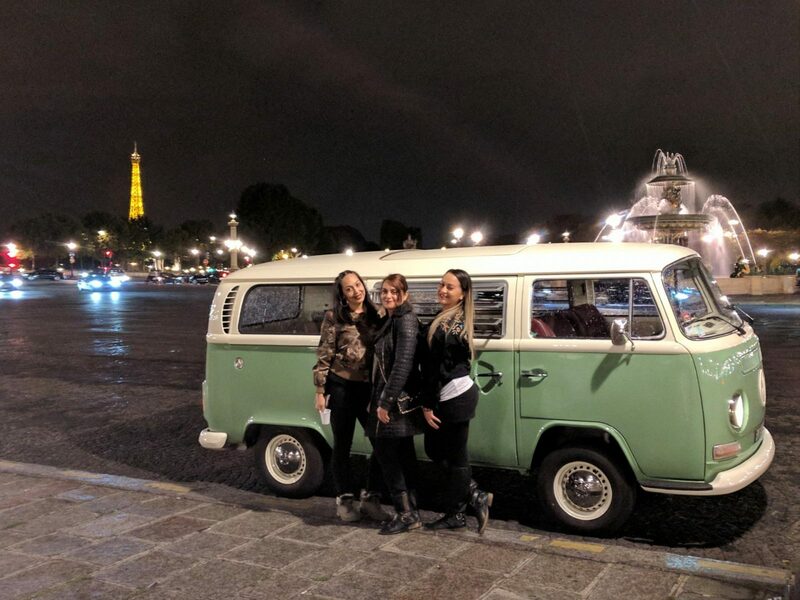 What I loved most about this tour was that it was perfect for someone who have never been to Paris AND the person who has been multiple times. All of the guides are born and raised Parisians and so they are very passionate at showing and teaching you all about their city. They know this city like the back of their hand and when you get dropped off at the end of the night – you will not be disappointed. This was the absolute BEST tour I have ever done in Paris and cannot recommend it enough. Click HERE to check out all of the tours they offer and HERE to check out their cars. If you book with them, let them know Shareen from Pearls & Paris sent you! *Just a sidetone: This post isn’t sponsored nor do I or you get a discount if you book and say I sent you lol I just like companies to know when I post about my experience with them. 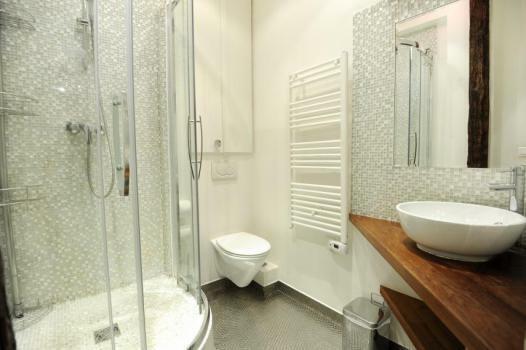 There’s something super charming about renting an apartment when visiting Europe. To live like a local for a few days or even a few weeks really helps you indulge in the culture and lets you see the city in a different light. Paris is MY city… I mean, it’s not literally mine but I just have this connection with it. 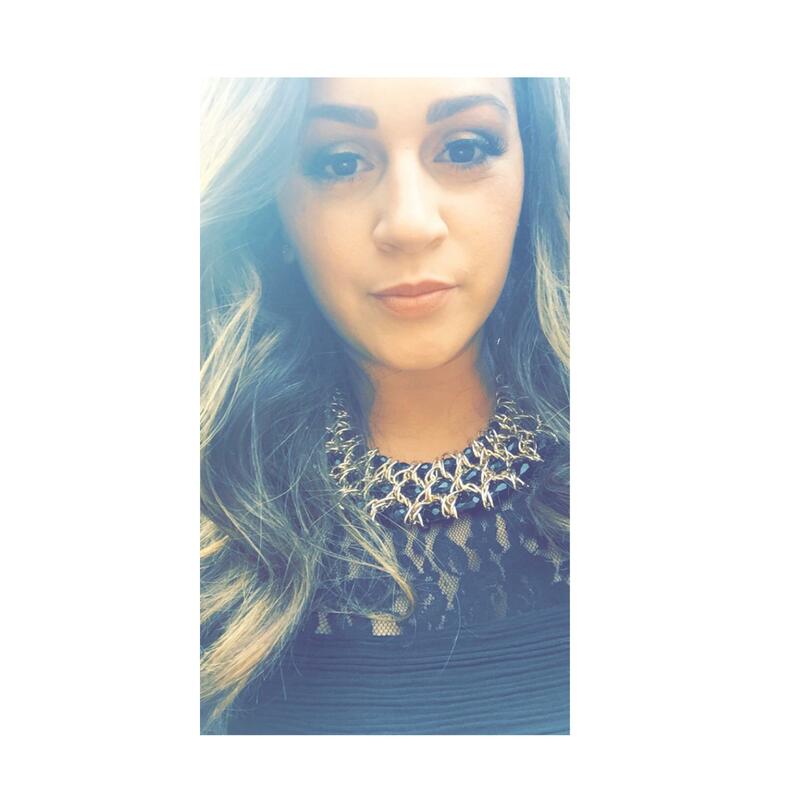 The city, the people, the food…. the buildings! The buildings and architectures are this perfect blend of Gothic style and elegance. I have been to Paris twice now and both times have stayed at a rental property. Each so different yet both exceeded my expectations. I highly recommend renting a place in one of these beautiful buildings when visiting. 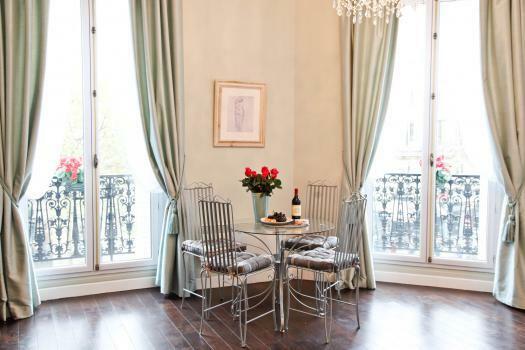 These are a few of my favorite apartments that can be found through Cobblestone Paris Rentals. 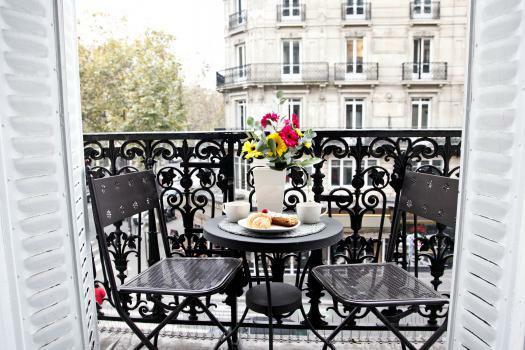 Balcon Notre Dame – This is the apartment I rented on my last visit to Paris just a few weeks ago. First of all, it’s located in the Latin Quarter (5th & 6th arrondissements) which happens to be my favorite part of Paris to stay in. It literally is located in the middle of everything and the ideal location for walking to many of the landmarks. The apartment itself fits 4 guest very comfortably between its 2 bedrooms and has a modern kitchen with a spacious livingroom area. My favorite part of the apartment is the walk out balcony that overlooks the Seine River and Notre Dame Cathedral. 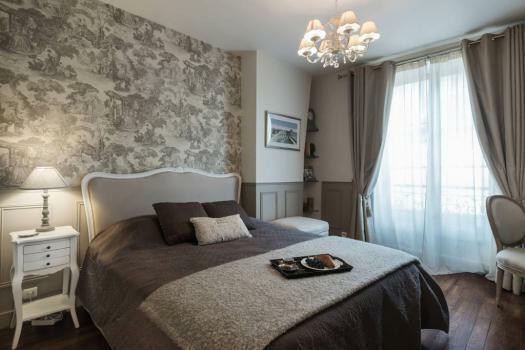 La Charme Du Marais – This rental is super dreamy and where I want to stay for my next visit to Paris. 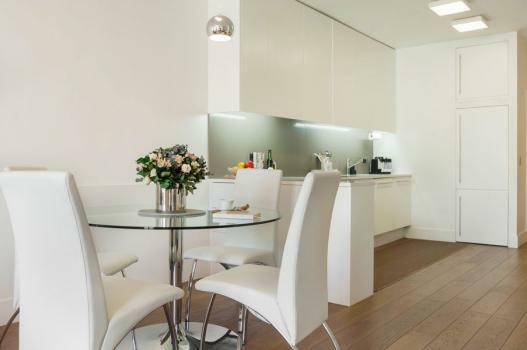 It is an elegantly furnished 1 bedroom apartment that can accommodate 4 guests with a large open-style living/dining space with a full kitchen. 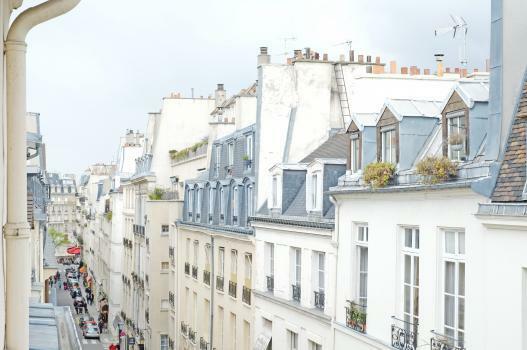 It’s located on the border of the 1st, 2nd and 3rd Arrondissements so you will have the pleasure of enjoying 3 wonderful neighborhoods of Paris. The small walk out balcony with chairs is a charming addition. 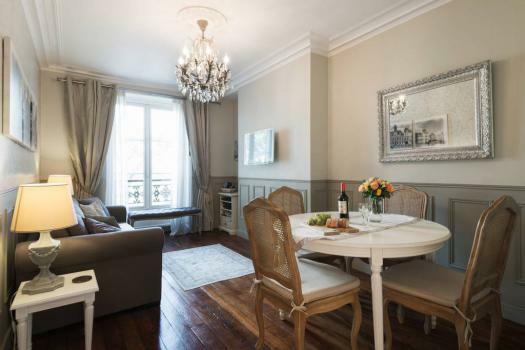 Le Triomphe Elysees – This apartment is on the border of the 8th & 17th arrondissement where some of the most famous shops, five-star hotels and Michelin gourmet restaurants are located. 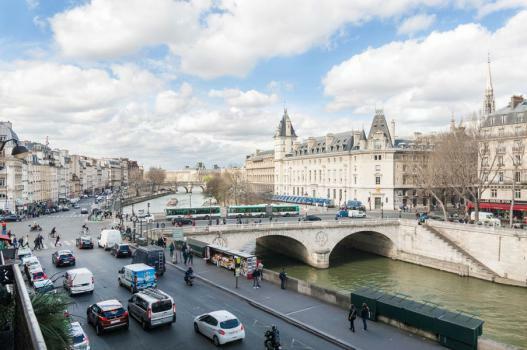 You are steps from the famous Arc de Triomphe and from the “Place De L’Etoile” where you can check out views of Champs Elysees Boulevard and the Eiffel Tower. 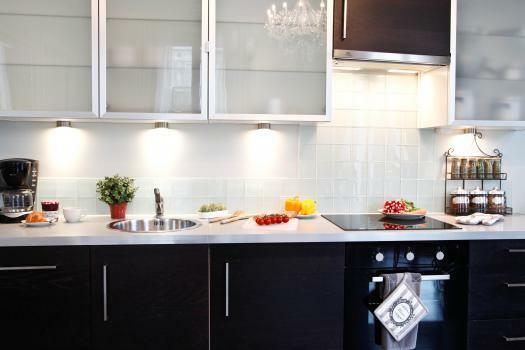 This one bedroom apartment is filled with historic Parisian charm. 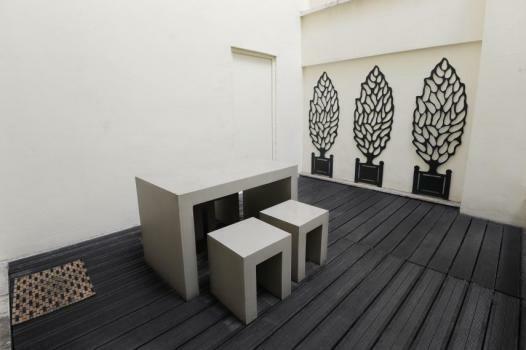 Terrasse Du Sorbonne – This 2 bedroom apartment is located in one of the most desirable neighborhoods, the Latin Quarter, right beside the Sorbonne University. 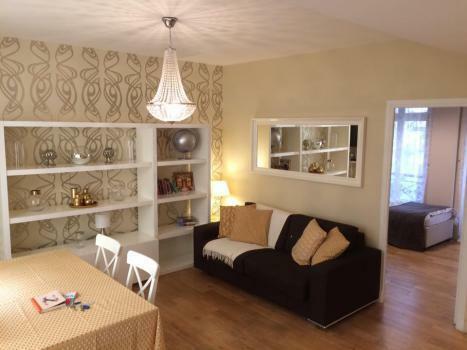 It is a large, 2 bedroom apartment that fits up to 5 guests. 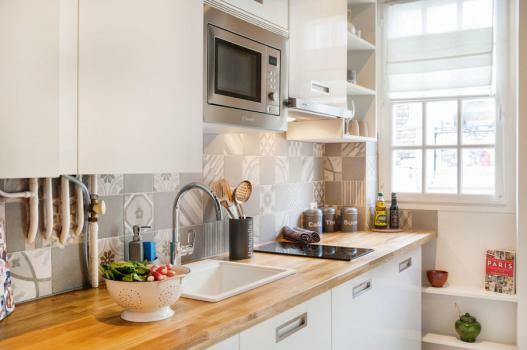 From this apartment you will have an easy walk to many central sights such as Saint Germain Des Pres, The River Seine, Notre-Dame Cathedral, Musee D’Orsay, Musee Du Louvre and the Jardin Luxembourg. It’s truly in the true center of it all and best of all – has a private terrace! 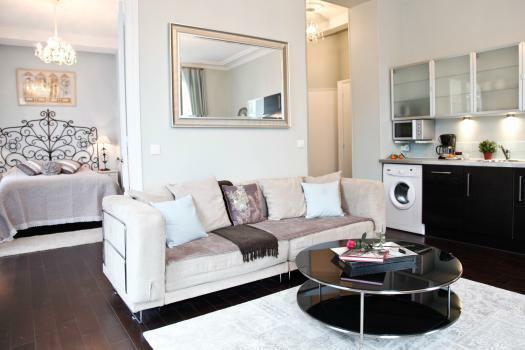 Le Grand En Isle – This one bedroom apartment can accommodate up to 4 Guests. 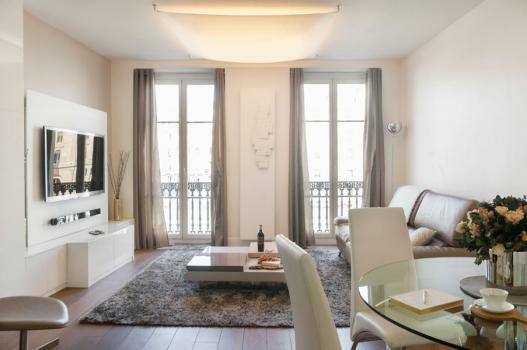 It’s located on exclusive Ile Saint Louis which is steps from Notre-Dame Cathedral. 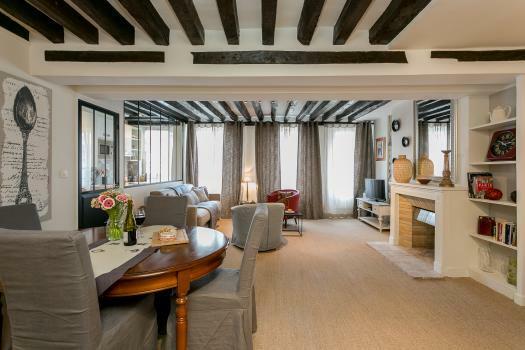 it is renovated with high-end fittings and furnishings and is stylishly decorated in a historic style to accentuate the original 17th century architectural. 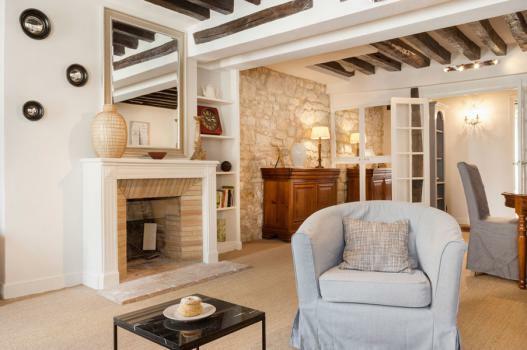 Don’t these rentals make you just want to hop on the next flight to Paris?! 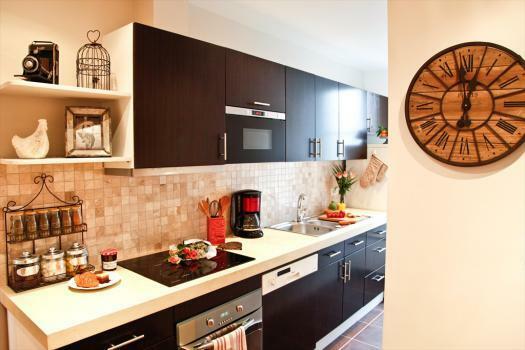 Make sure to check out Cobblestone Paris as they have many more rentals all over the city. If you guys have any more questions on where to stay when visiting – feel free to shoot me over an email.